This entry was posted in Uncategorized and tagged 2", Christ, diligent, faith, father, focus, forgive, frustrate, grace, gratitude, heaven, Job, knowledge, love, Mighty God, path, perfect, perfection, perfectionist, plan, pray, prayer, Proverbs 4, Psalm 92, read, Ruth, scripture, spiritual, stronger, struggle, training, trust, truth, victory, work by admin. Bookmark the permalink. I am prone to say "People over programs." 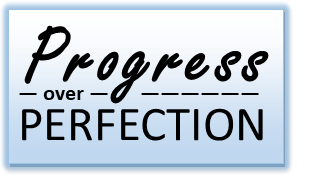 I now have a new one "Progress over perfection." I am not a perfectionist by any stretch but I often expect more out of me than I am. Even more sadly is I often expect more out of others than I do of myself. I wan them to be "right" while I can fudge a little. Hmmm not good. Thanks for the good reminder today Kari. You're welcome, Bill. As I said in the post, I need the reminder too.